"There is no greater power than a community discovering what it cares about. Ask what’s possible? Not what’s wrong? Keep asking''." Get in touch, let's discover what's possible together. 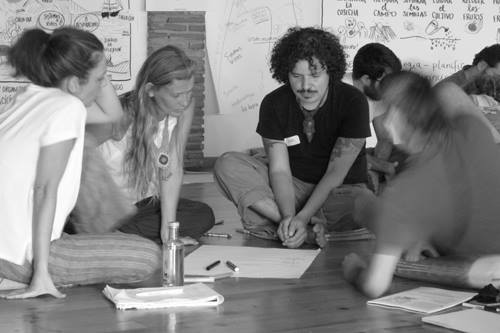 ​We facilitate collaboration, active engagement, participation, co-design, self-organisation and community building. We are group process designers and conversation hosts, community organisers, graphic facilitators who want to be the change we want to see, and transform the world through generative listening, meaningful dialogue and self-organisation. In Open Space meetings people can create time and space to engage deeply and creatively around issues of concern to them, the agenda is created by the participants and results are a collective effort born from the passion and responsibility of the participants. A Method for creating a living network of collaborative dialogue. Particularly effective in surfacing the collective wisdom of large groups with diverse people. Its an ancient form of meeting used by humanity for millenia, which supports deep listening, reflection, decision making and connection, creating a safe space for diverse thinking to coexist.